Hoolock hoolock (the western hoolock gibbon) is a species of the family Hylobatidae (small apes), which constitutes the superfamily Hominoidea (hominoids) together with Hominidae (great apes and human). Here, we report that centromeres or their vicinities in this gibbon species contain tandem repeat sequences that consist of 35–50-bp repeat units, and exhibit a sequence similarity with the variable number of tandem repeat (VNTR) region of the SVA, LAVA and PVA transposons. SVA is a composite retrotransposon thought to have been formed by fusion of three solo elements in the common ancestor of hominoids. LAVA and PVA are recently identified retrotransposons that have the same basic structure as SVA. Thus, the large-scale tandem repeats in the centromere region may have been derived from one or more of SVA-type transposons, including the three mentioned above and other yet unknown elements, or the repeat sequences could have served as a source for such elements. Amplification of VNTR-related sequences in another gibbon species, Hoolock leuconedys (eastern hoolock gibbon), has recently been reported, but it is yet to be examined whether the large-scale tandem repeats observed in the two species originated from a single event that occurred in their common ancestor. 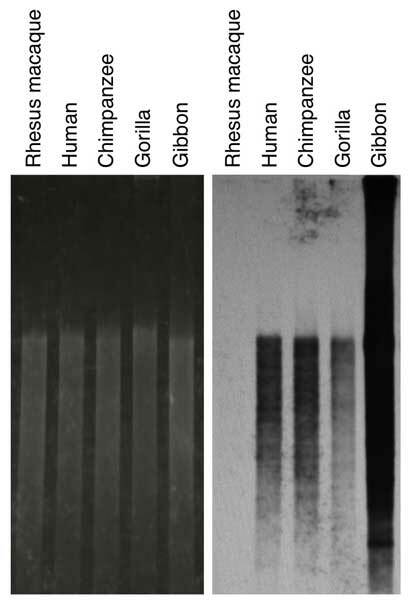 The repeat sequences in the western hoolock gibbon are mostly 40 kb or more in length, are present in 28 of the 38 chromosomes of the somatic cells, and are homozygous for chromosomal presence/absence. Journal of Human Genetics, doi:10.1038/jhg.2012.107.